The RootMaker System uses a very special container. This method provides a tree that transplants with up to 90% of its total root mass and therefore has a minimum of transplant shock. It also does a good job of managing the tap root until the tree is planted in its final location. For this reason we have decided to focus on trees that have hard to manage tap roots and that tend to be slow to establish after transplanting. Among these are many of the Oaks and Hickories. First we plant seeds in small root pruning pots in the early spring. In mid-summer we transplant the small trees into medium sized root pruning pots for further growth. In subsequent years we water the trees, control weeds, and do a little pruning until they are ready for market. Young trees growing in the RootMaker System. 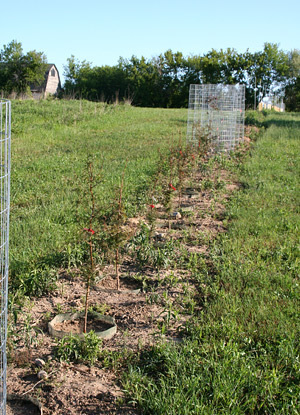 In addition to the trees grown using the RootMaker® System, we have quantities of White Spruce, White Pines, Kentucky Coffee Trees, and Black Oaks that are being field grown. 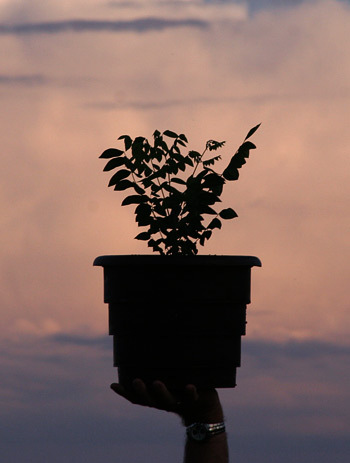 Smaller sizes are available in containers and larger ones are available as direct transplants. We believe that trees that are native to Michigan will be the easiest trees to grow in Michigan. In addition, they will be the trees most likely to fit well into the Michigan ecosystem. For these reasons, we focus mainly on Michigan native trees and where possible we grow these trees from seed that has been collected in Michigan, usually within 30 miles of our farm.